When I went to New Orleans for my friend’s wedding, he introduced me to a new food that I had never had before on the morning of his wedding. The groomsmen (and one groomswoman) gathered at my friend’s house and had breakfast together, which one of the groomsman prepared for us. That breakfast consisted of homemade Boudin Pork Sausages (often pronounced Boo-dan in New Orleans) from Cochon Butcher Shop. We also had bacon, a bourbon gravy, and Art In The Age (Root, Snap, and Rhuby) alcohol drinks. The boudin he bought contain pulled pork, rice, and a lot of cajun spices. This was different from any sausage I’d ever had before. It wasn’t firm like most sausage, but instead had a soft texture because of the rice. If it wasn’t in a sausage casing, you might consider this a really thick, meaty, dirty rice. I was so impressed and just plain happy eating this decadent breakfast that I knew I needed to replicate it at home. There was just one problem. 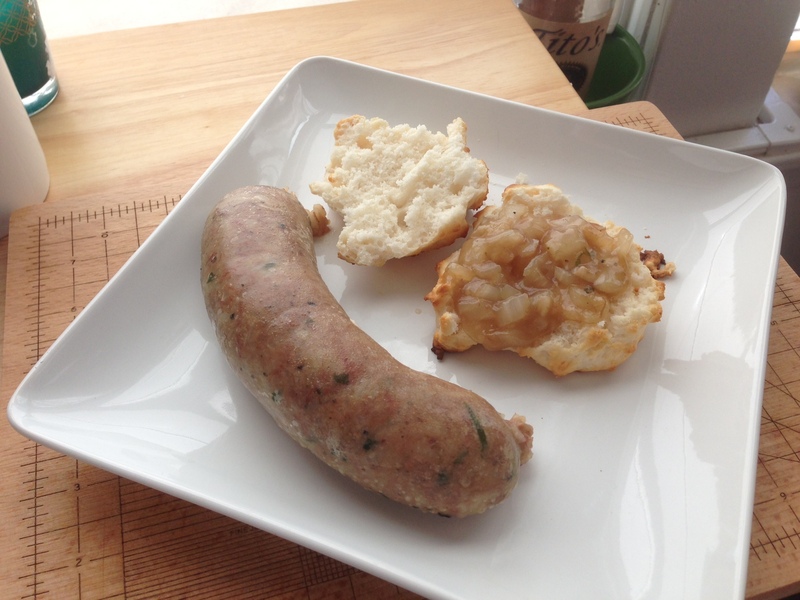 It’s really not easy to get boudin in the northeast. 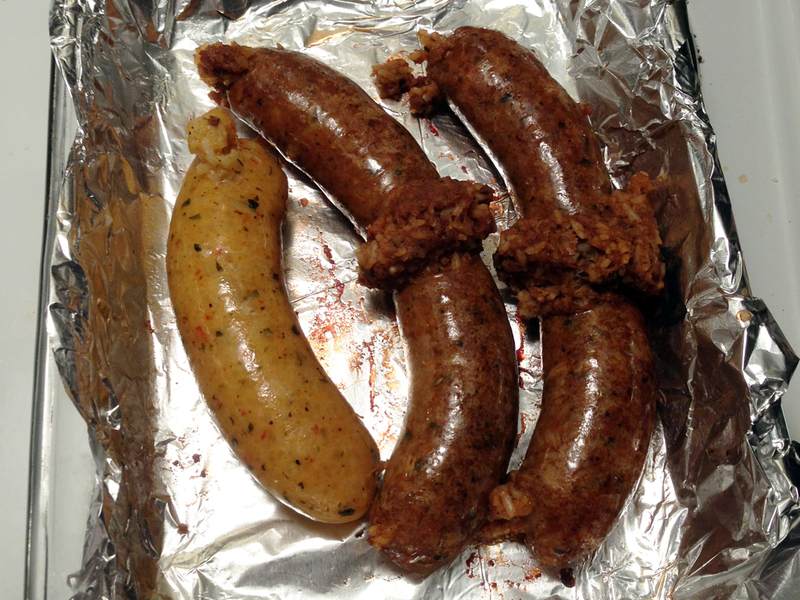 With that in mind, I ordered two different kinds of boudin (one pork and one crawfish) from Cajun Grocer online. They have decent prices, but the shipping cost is nuts. I would have ordered from Cochon Butcher, but they don’t deliver food! After some online research, I ordered Poche’s brand crawfish and pork boudin instead. The crawfish boudin tasted alright, although a little fishier than I would like, but the pork boudin was nothing like what I wanted. It was dark and tasted mostly of liver (in hindsight, I think I wanted boudin blanc). I’m sure this is actually good from what I’ve read regarding traditional boudin, but it wasn’t what I had in New Orleans. 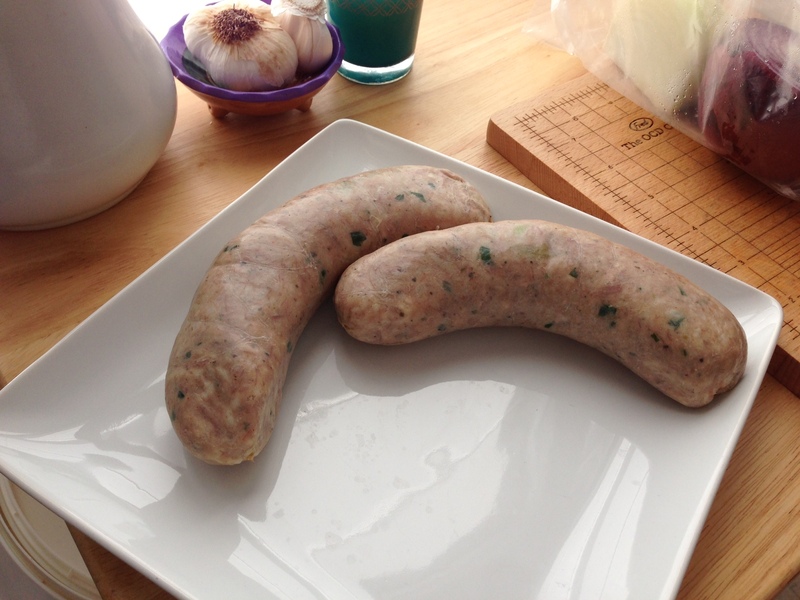 Regardless, I figured that this would be a great opportunity for me to practice my first attempt at boudin preparation (my successful second attempt is the recipe below, so don’t worry). I decided to prepare it two different ways to try it out, so I settled on steaming and baking. Steaming is pretty traditional while baking is a little less traditional. The end result of my first attempt was a huge fail on the steaming and a mild success on the baking. 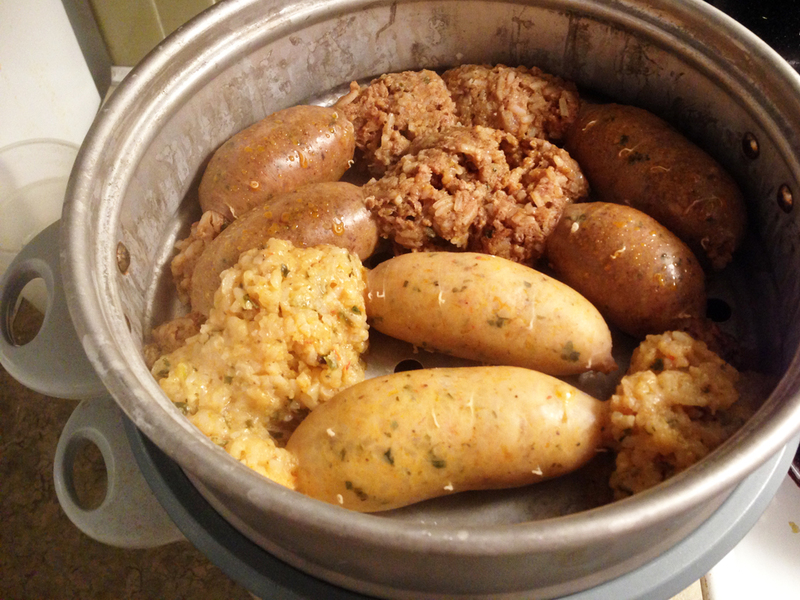 I over-steamed the boudin because I used a covered steamer/rice cooker, which meant they burst pretty badly due to the high heat. I baked the boudin pretty well though, and the only reason they burst was because the sausages snapped in half during shipping while they were frozen. I preferred the baked in this case because the casing turned out kind of crispy and the insides were well cooked. The steaming made for a sludgy mess without too many good textures. I was in luck though, because the same friend that introduced me to boudin came to visit me and he painstakingly brought me fresh boudin from Cochon Butcher Shop. They might not deliver, but my friend does! He carried it on the plane in a ziploc bag surrounded by ice, surrounded by a thermal lunch bag. When he arrived at my place 9 hours later, the sausages were still cold and there was still plenty of ice. It was time for a delicious boudin redemption and for my second attempt I tried to replicate exactly what I had in New Orleans! 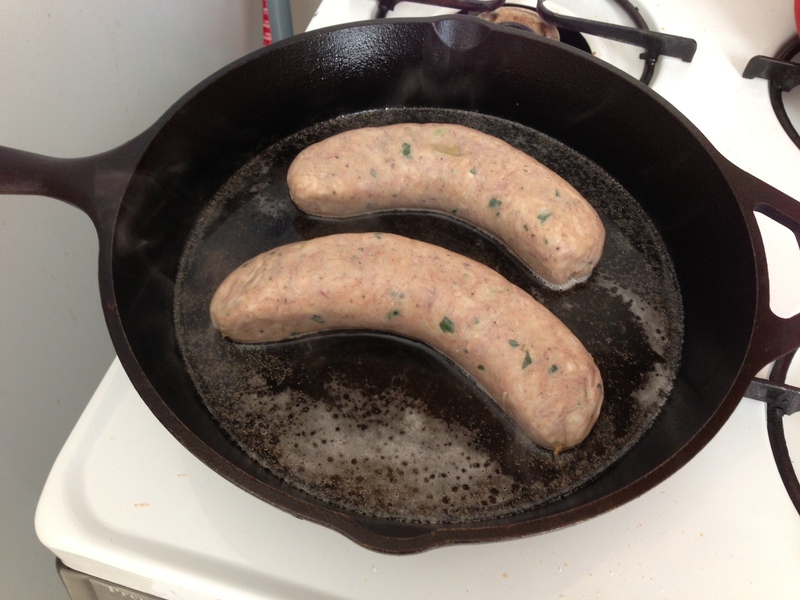 Set two boudin links out so that they get to room temperature. 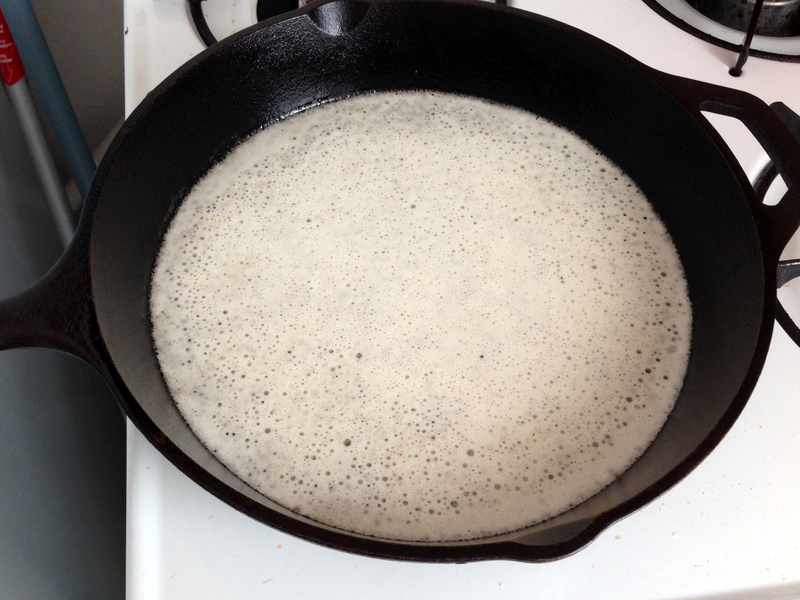 Place a saute pan on the stove, set the temperature to low heat, and pour in half a bottle of light colored beer. Bring the beer to a low simmer so that there are bubbles, but the beer isn’t at a roiling boil and evaporating too much. 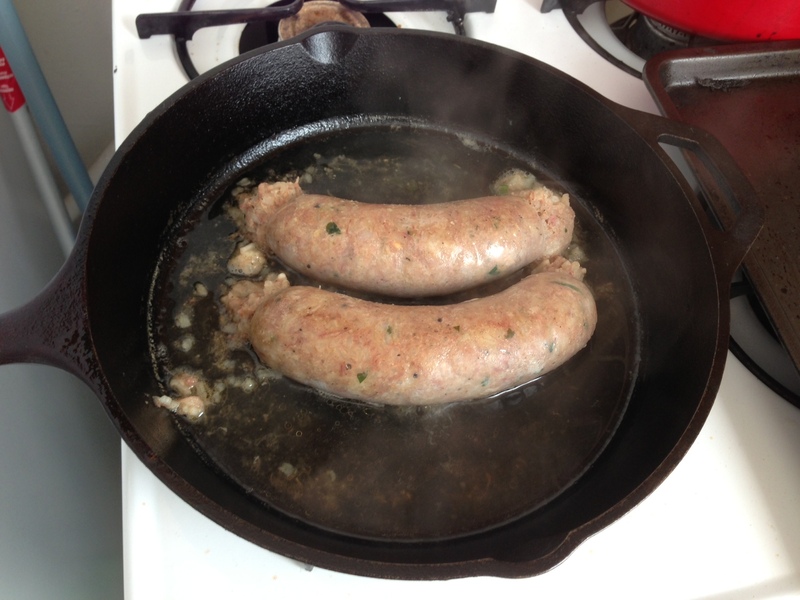 Place the two links into the beer and simmer the boudin, uncovered, on very low heat for 8-10 min. The lower and easier the simmer, the better because you don’t want to oversteam the boudin and have them explode. 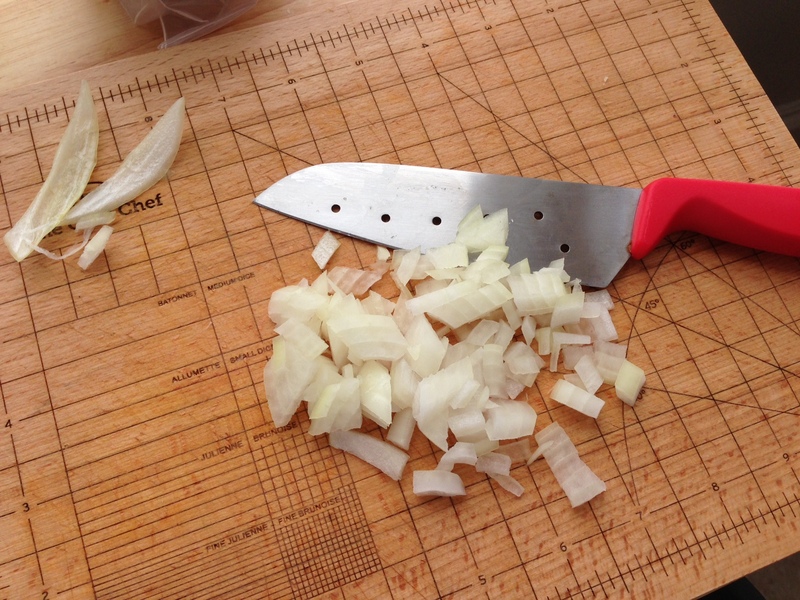 While the boudin simmers, cut up a quarter of an onion or half a shallot into small diced pieces. After 8-10 minutes of simmering, carefully roll the boudin over and simmer on the other side for another 8-10 min. Don’t worry if a little bit of the filling starts to squeeze out. That will actually help make a really great gravy later. Carefully remove the boudin links and set them aside on a plate to let the juices settle, but leave all of the liquid in the pan. Toss in the diced onion into the pan, add a tablespoon of scotch or bourbon and simmer the onions until they start to get a little softer. Add in a little freshly ground black pepper. 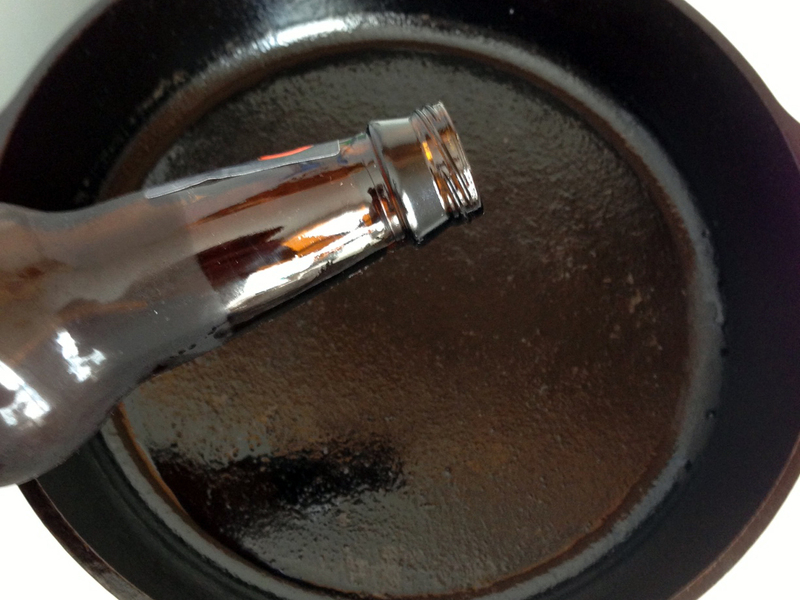 A few turns of a pepper mill or a pinch should be enough. In a measuring cup, pour 1/4 cup of water or 1/4 cup of some more beer and then add in a teaspoon of cornstarch. Mix the cornstarch with the cooler liquid very well (the liquid should be room temp or cold so that the cornstarch doesn’t clump). 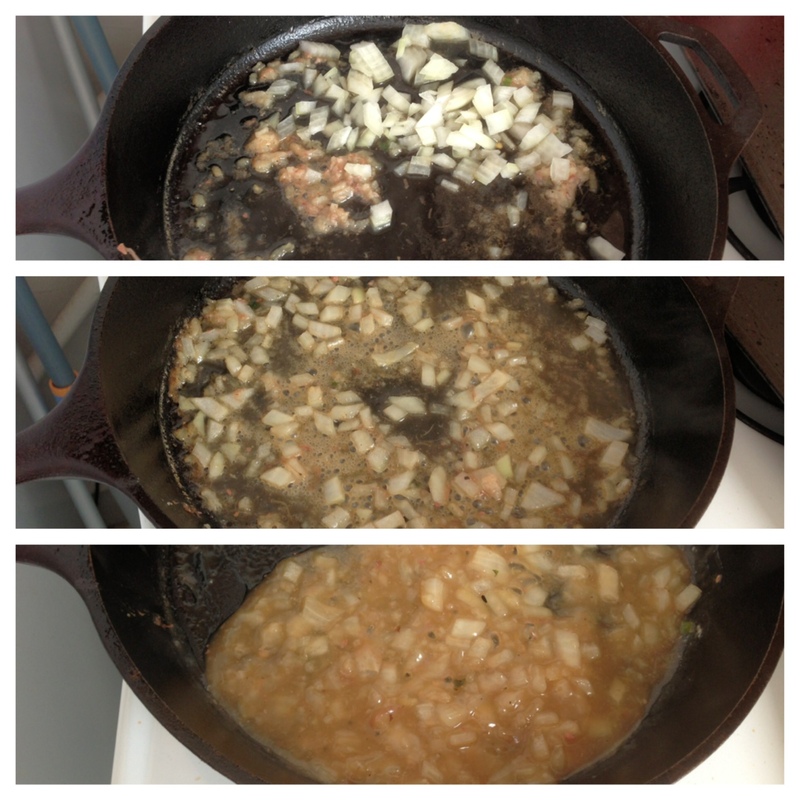 Pour the cornstarch liquid into the pan, stir quickly, and bring the ingredients back up to a simmer. This liquid will thicken and reduce very quickly, so be careful and remove it from the heat as soon as you get the desired consistency/thickness. Place the gravy into a small bowl and serve along with the boudin. Fun Fact: The groomsman who prepared this for me the first time I ever had it, made bacon in the pan prior to steaming the boudin. That really added a whole new layer of flavor to the boudin and the gravy. Just something to think about if you want to double up on the pork! 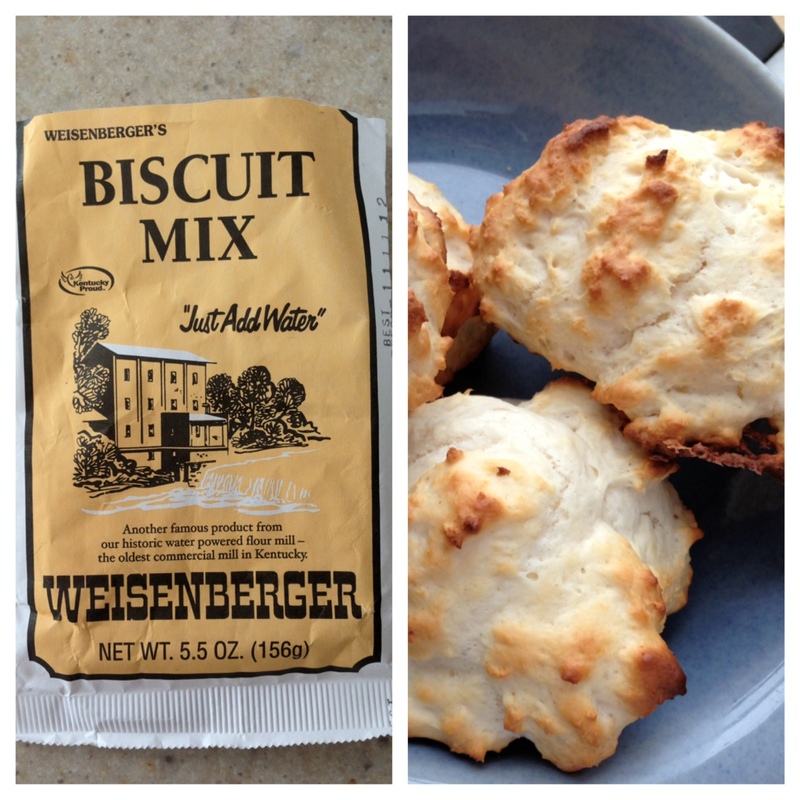 Serving Suggestion: You can serve them with a biscuit using some really simple Weisenberger Biscuit Mix. These biscuits are absurdly easy to make, they cook quickly, and they taste crispy, but they’re not very heavy. Definitely worth a try if you’re in the mood for a biscuit, but don’t want to do any of the painstaking work. Definite man fuel. Sausage and beer. Excellent. Agreeing with Conor all the way. That looks like amazing stuff! 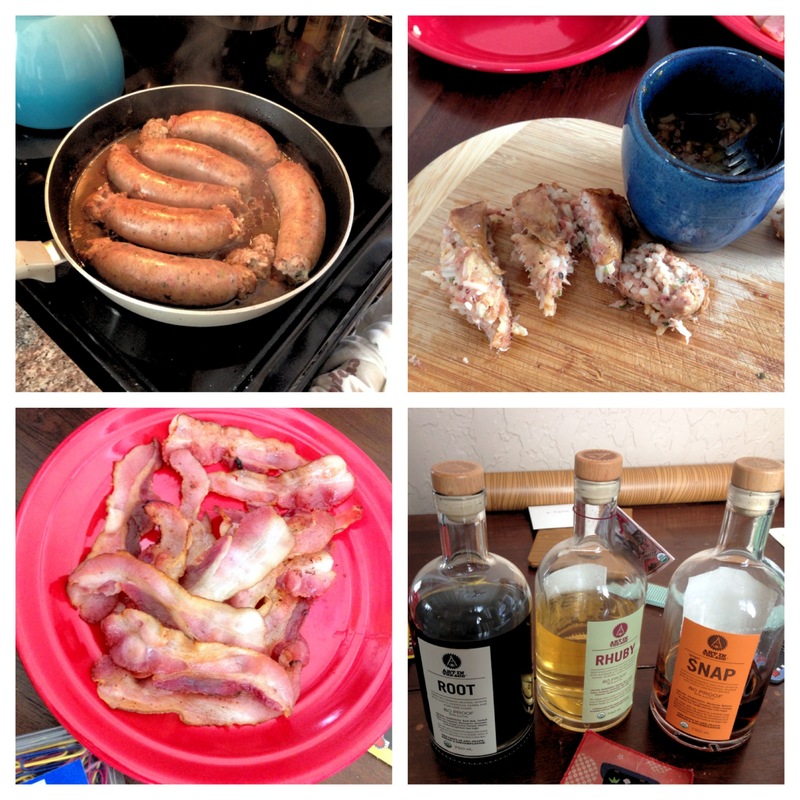 Sausage is just the greatest… seriously. Makes me miss Germany, but Nawlins is much closer so maybe I’ll just have to make a trip down there this year! I am dying to go to Germany. It always looks like a great time when I see pics from my friends. It’s definitely on my list of places to visit. If you head to New Orleans, try and go in the winter. It gets crazy humid and hot down there in the summer. Thanks for stopping by, Adam. Glad I could help out in the macho department!